The #getoutside hashtag is one I always put in my social posts, because to me no day is complete without getting active outside for at least some small part of it. The tag has over 9 million posts on instagram alone, so I’m not alone in this sentiment. One of the main reasons I adore living in Banff in it’s wide ranging list of possible outdoor pursuits. I’m happy to say I’ve knocked most of them off the list now with a few notable exceptions (I’m looking at you, ice climbing!) and whilst there are some I enjoy more than others it’s really amazing what you can get up to to be active in the mountains. Each season brings with it new adventures, more plans, and excitement for the future. It’s the epitome of living in the moment, and in making sure that moment can be extended indefinitely. Right now we are embracing the winter snow sports that Banff is known for. I’ve already written quite enough about skiing, and this countdown will be over before spring returns, so let’s look at some of the other pursuits people get after in Banff and the surrounding areas. I’ve never attempted this, so I really cannot have an opinion. But add together my comments above with the fact that you’re now ascending a sheet of freezing, brittle water using spiky ice tools… the two do not go hand in hand in my eyes. But people love it. 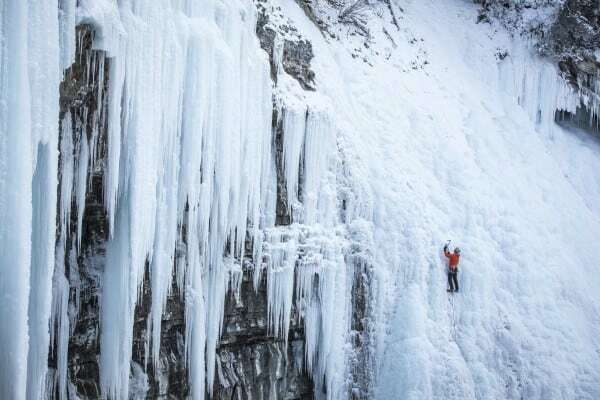 One of my life philosophies is to try anything once, so maybe this is my year to get out ice climbing. Banff, Yoho and Lake Louise are veritable meccas for Ice Climbing gurus the world over, so I’m sure I can get into it somehow. Photo by Banff & Lake Louise Tourism / Noel Hendrickson. This is basically what runners do in the winter! 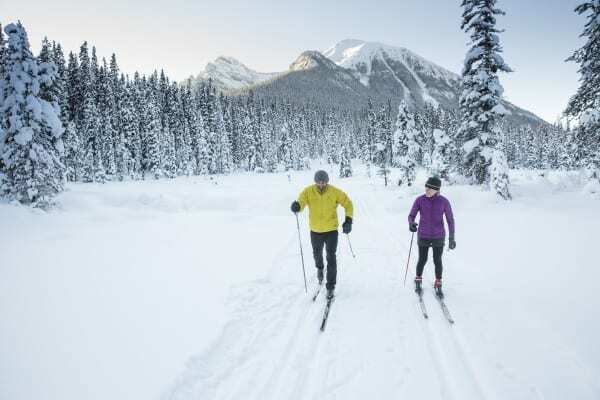 It’s a wonderful cardio – packed activity that gets you out and about in the beautiful mountains when it’s -15 outside. I have to say I was surprised at how fun it was; I typically enjoy flying down the mountains at a rate of knots rather than scootching along on the flats, but give me a clear sunny day, a beautifully track set trail, some good company, and good times are guaranteed. The other good thing is that it’s pretty accessible for anyone, regardless of whether you are at home sliding on snow or not. I took two friends out on a 12km ski to hut on their second day of being on two planks, and although there were a number of tumbles into pillows of soft, deep, snow (that’s impossible to get out of) we had the MOST fun! 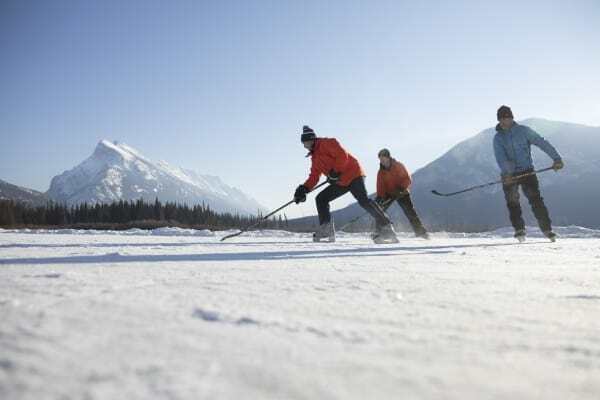 Photo credit: Banff & Lake Louise Tourism / Noel Hendrickson. 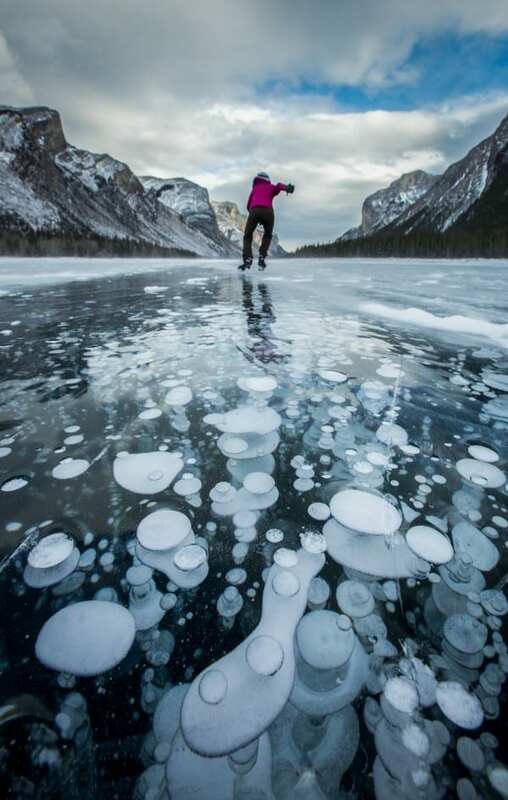 Does it get more quintessentially Canadian than skating out on a frozen lake? Unless you’ve brought along a friendly Mountie playing a Tragically Hip album, a Tim Hortons and there’s a moose hanging out on the shore, then probably not. Banff has at least 5 primo ice skating locations within easy reach. The high school flood their playing field through the winter, so downtown skating is the quickest and easiest way to get involved. They have heating stations and lighting too, so bring on the moonlight skates for a cool evening activity! Otherwise, the Vermillion Lakes and Lake Minnewanka are supremely picturesque if you just have to get the photo, and they clear a skate loop on the Bow river which I like to use for a quick skate on my lunch break! 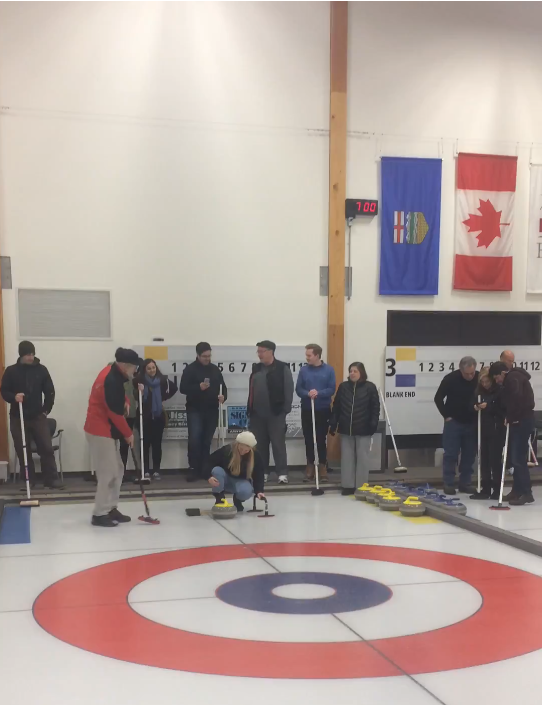 I feel like curling should be Canada’s national sport, rather than lacrosse. It’s like lawn bowls, except on ice (be careful, it’s more slippery than it initially feels and there WILL be bruises) You play in teams, and if you go down to the Fenlands Recreation facility on a Wednesday then you can join in a team in a learn-to-ski evening with friendly completion and handy tips. The actual throw is more challenging than you would think. and the brushing doesn’t seem to do much at first, but once you get into the swing of it it’s a great team sport, and a thoroughly enjoyable evening. 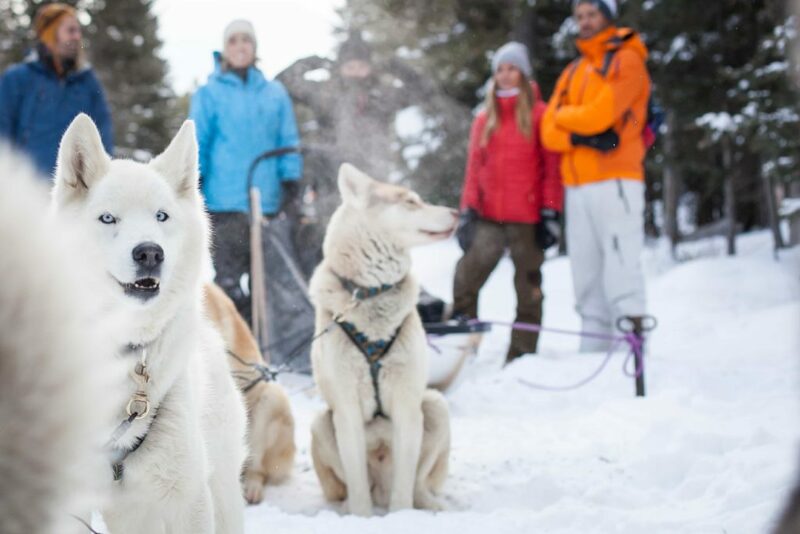 Mushing, or being pulled in a sled by a team of huskies, has got to be one of the most unusual ways to get outside. It’s always good to get out with your four-legged friends, and they seem to be having as much fun (if not more) than you are! As they are putting in the majority of the effort be aware you will likely get cold, but it’s still one of the most original ways to get out and see the mountains. You can take it in turns to “lead” the team (although to be honest they don’t need much in the way of leadership!) and be pulled in the sled, cosily wrapped in thick heavy blankets. Finish the run with a warming hot chocolate and baked treat around a roaring fire.